After breakfast, one-hour flight to Hue, the Imperial Capital of Vietnam and arguably Vietnam's most pleasant city which remains largely unchanged by the rapid growth that has transformed other parts of the country. After meeting cycling crew, transfer to hotel for refreshments and bicycle fitting and adjustment, followed by a short orientation ride to lunch along the pleasant Perfume River. After lunch, leisurely bicycling through the Royal Citadel, recognizable from images broadcast during the Tet Offensive of 1968, and onto the 17th century Thien Mu Pagoda — Vietnam's most important Buddhist temple and symbol of Hue (right). On the return, exploration of bustling Dong Ba Market before freshening up at the hotel for dinner. Transport to dinner in traditional cyclo — pedicab. Overnight at the pleasant La Residence Hotel or other hotel. After breakfast, cycling through the picturesque countryside outside of Hue to Imperial Tombs, visiting two of the finest examples of Imperial architecture, the Tu Duc and Ming Mang, also stopping at the temple widely considered a gaudy excess — Khai Dinh, but we still love the setting. Afterwards, board a private, traditional dragon boat for the return to Hue, our on-board cooking up delicious local specialties such as Banh Xeo — a tasty crepe dish. Afternoon and dinner free for further sightseeing, or relaxing and massage to prepare for the morning's most challenging ride of the trip. Accommodation at La Residence. Rise early for an epic ride through some of Vietnam's most picturesque landscapes. 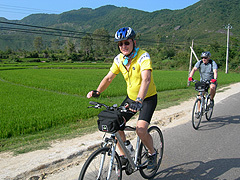 We begin biking from Hue along a coastal road with light traffic, through rural villages tending emerald green rice fields abutting the ocean. 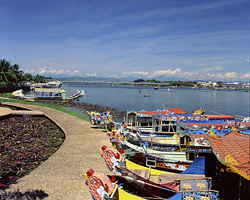 By midday, it's time to break at Lang Co Lagoon, one of Southeast Asia's most scenic beach areas. 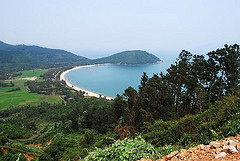 After a seafood lunch, riding over the dramatic Hai Van Pass (Pass of the high clouds), the summit affording wide panoramic views of Lang Co to the north and Danang to the south (parents may choose to ride this while younger children hop in the van). As the traffic increases around Danang, board the van to skirt the city (with an optional stop at the Cham sculpture museum). 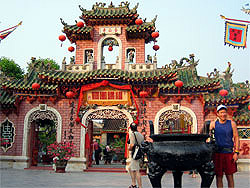 Continue onto Marble Mountain, exploring it's interesting grottoes and temple as well as marble crafts shops. China Beach, a famous "R&R" location fro American soldiers is nearby and worth a stop and perhaps a swim in the waves. This epic day ends with a room overlooking the ocean at Hoi An's Cua Dai Beach and a wonderful dinner at one of Hoi An's delightful restaurants. Overnight at the Victoria Resort (Ocean View) or Nam Hai. Morning exploration of pleasant Hoi An by foot, including the Thu Bon River Market, rare traditional wooden homes, art studios, and pagodas. Lunch of Cao Lao Soup, a unique dish from Hoi An. Following lunch, return by private car to Danang for flight to Hanoi or Saigon. 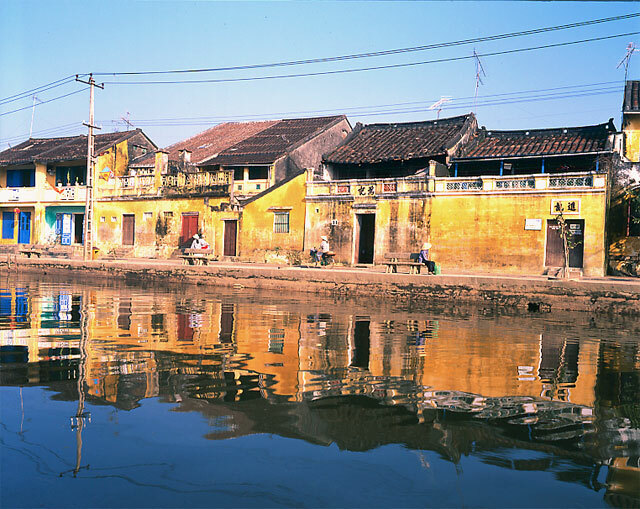 Note: Hoi An is typically everyone's favorite place in Vietnam, a small town where all the elements of a perfect place come together: picturesque setting, rich local culture, friendly people, and fantastic cuisine. We encourage you to stay on another day, either relaxing at the beach or exploring this special place. Included Meals: All breakfasts and lunches. Dinner recommendations, reservations and transport provided on all of our tours. 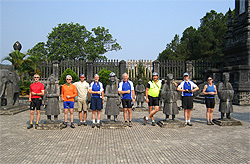 Note: This tour can be customized and combined with any of our other tours. Consider combining with our Halong Bay Kayaking, Mekong Delta, and Temples of Angkor trips. Please contact	us to plan your trip.